SUGAR HOUSE PARK – pavilion on south side. 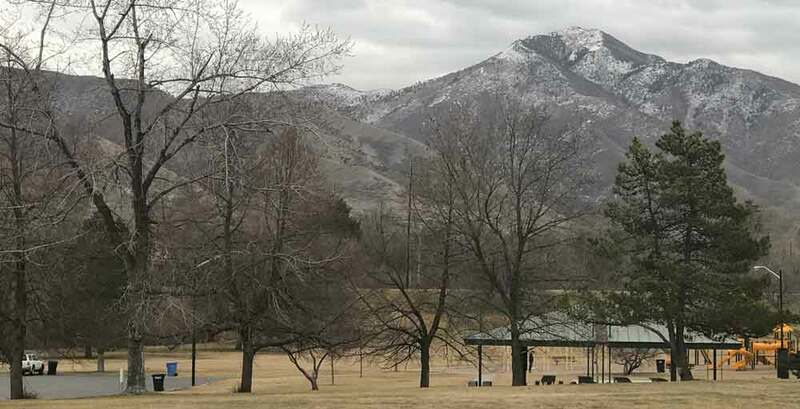 Address: Enter the park off 21st South at 1330 East 2100 South, Salt Lake City, UT 84106. Travel counterclockwise to the far side of the park. Park in the parking lot for the pavilion. TUESDAY we will meet at Mt Olympus Pavilion. It has shelter!! Bring a jacket. THURSDAY there is a 90% chance we will meet at the Mt Olympus Pavilion. (unless another group has reserved it… unlikely, and we’ll meet at Sego Lily Pavilion. We’ve always been able to meet at one or the other early in the afternoon. Watch for the white Honda pick-up with Earth Science Education insignia. WEATHER: The pavilions provide some shelter. If it rains, we’ve made arrangements to retreat to a nearby restaurant. TUESDAY’S WEATHER LOOKS . MARGINAL to COLD / WET. Don’t be late as we may make the decision AND relocate by 4:15 PM. Here’s my cell 801.647.8155. THURSDAY’S Weather looks fine… a great day to have Earth Science Outside. NOTE: Safety first. 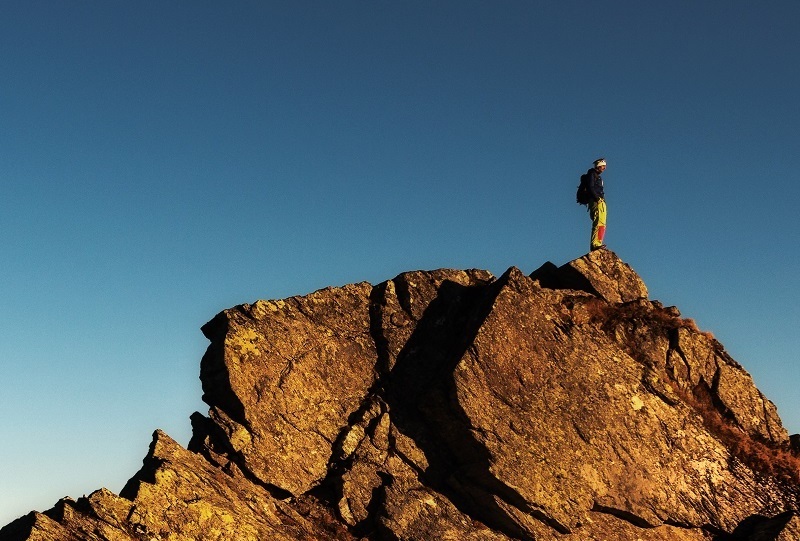 ALL outdoor exercises have inherent safety concerns. Be prepared with sensible shoes, walking stick if desired, clothing appropriate for weather, etc. SAFETY is a group endeavor. Speak up for safety! There’s never been an issue at this site, let’s keep it that way. Repeat to remember... remember to repeat. 4:15 – 4:45 -- Read the landscapes viewed from Sugar House Park. Patterns of Earth materials: specifically, patterns of sediments; and patterns of bedrock (layering). Patterns of landforms: familiar landforms. Landmarks as a path toward sense of place. 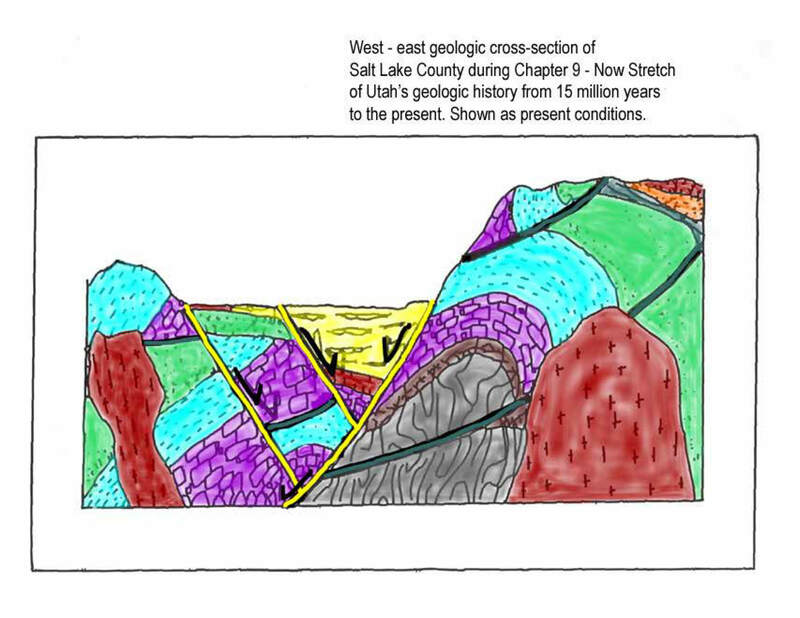 Introduction to "UofU Geology Panorama"
4:50 PM – 5:15 PM -- Nine Chapters of Sugar House Park's Geologic Past. 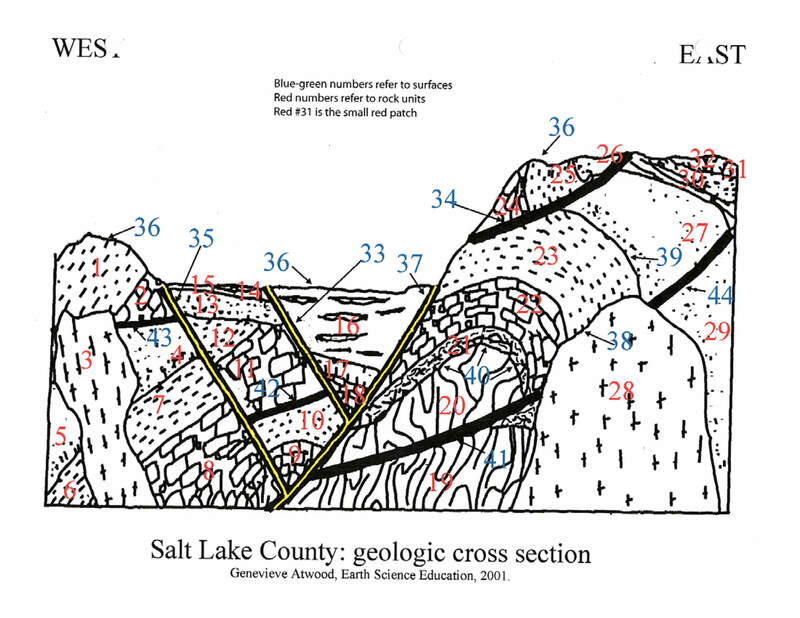 Color the UofU cross-section. Please color the rock units from oldest to youngest, including "Chapter Nine: Now! Stretching to the West and Stability to the East." Review the rules of relative age. 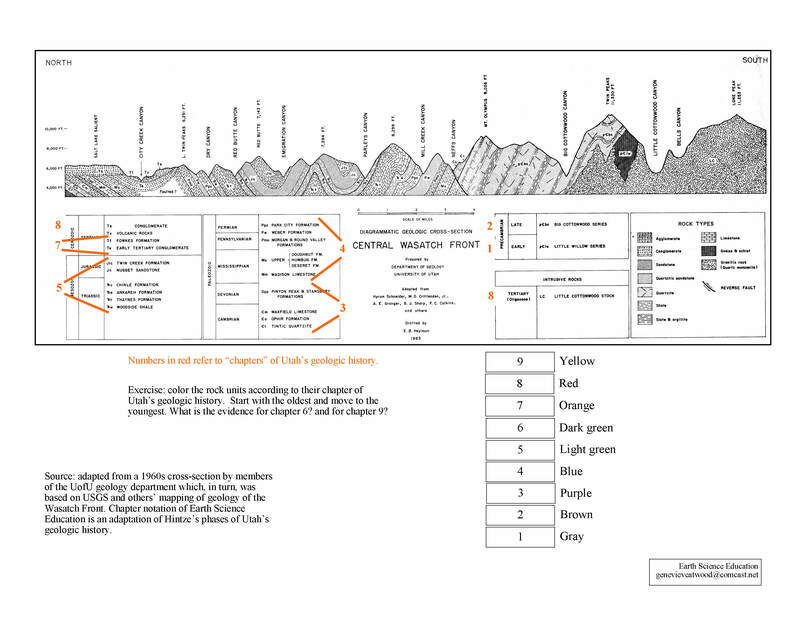 For example: how do we "know" that the bedrock of Lone Peak is younger than the bedrock of Mt. Olympus? 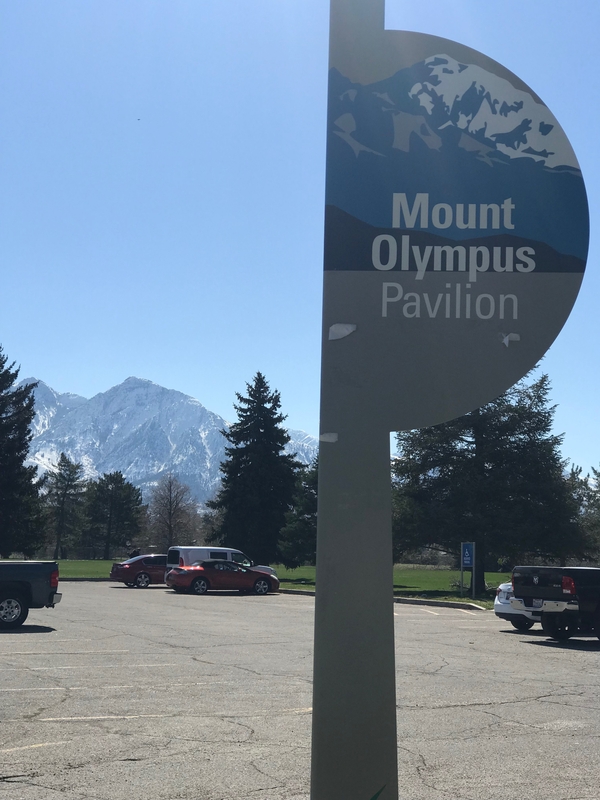 Is Mount Olympus getting shorter or taller over time? How do we know Parley's Canyon is younger than its bedrock? How would we figure out how the sediments of Sugar House Park got here, and when? Peg Alderman promises to create (bake) a stratigraphic model of the 18th Century set of ages: Primary, Secondary, Tertiary, Quaternary!! 5:30 PM - Expectations for FINAL PROJECT due April 22. 5:40: Re-read PATTERNS of the landscape from Sugar House Park. 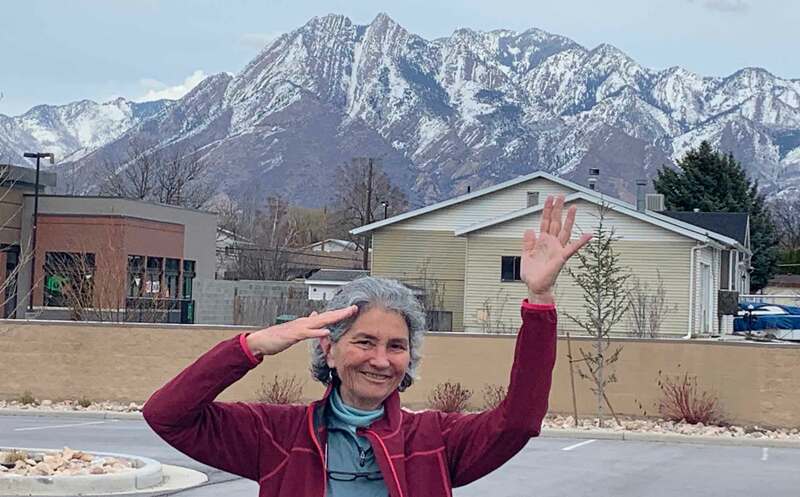 Specifically, read the patterns of an image of Mt Olympus taken looking north from 65th South and State Street. 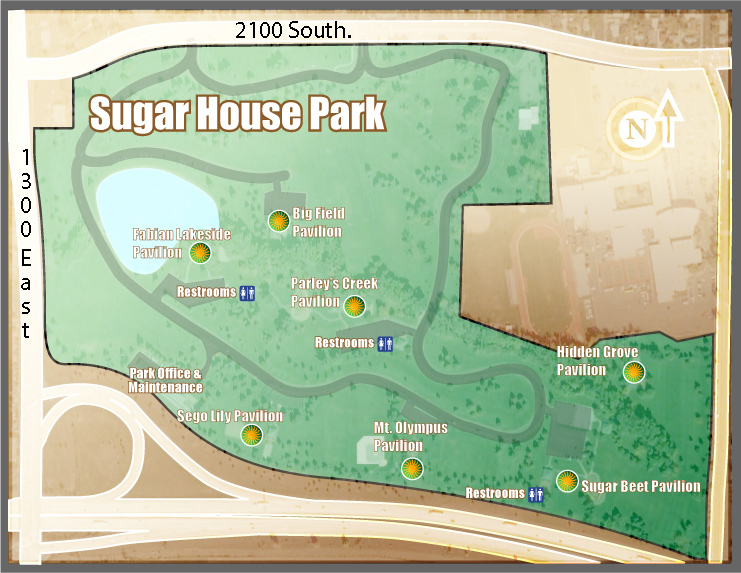 Relate that image to what we see from Sugar House Park and to what is shown on the UofU cross-section. 6 PM. Best wishes. Peg and I encourage you to invite us to your school yard to figure out your "Earth Science Outside." We know you are busy. We know you teach multiple subjects. We also believe that when you "know" your Earth Science Outside, you'll embrace your accomplishments from this workshop. FINAL DAY to submit assignments, etc. April 22.
teacher participants will have gained confidence taking steps toward landscape literacy. It's all about patterns. That’s the JOY of landscape literacy. Recognize a pattern, express curiosity, explore a concept. Salt Lake County and most of Utah not only have spectacular geology, we can see it! Go outside, anywhere! Share the JOY. What can you explore, question, find interesting. Step two: Look deliberately at shapes of landforms. Tectonics rules… today as in the past. Step three: Look deliberately at patterns of sediment versus bedrock (Earth materials). Think of patterns as clues, as pieces of a puzzle. What patterns do you find interesting? Can you see any “younger than / older than” relationships that your students would (a) understand and (b) find interesting? Express curiosity!